(Newser) – Beware any offer to share a Google Docs file, even if that offer appears to have been sent by someone you know. The Los Angeles Times reports thousands of people were targeted by a phishing scam Wednesday. The scam starts with an email with a link to a Google Docs file. According to Gizmodo, this email was received by—among many others—reporters at Hearst, Vice, BuzzFeed, and New York. Clicking on the link takes targets to a fake Google Docs website, asking them to login with their Google username and password. The most effective defense against phishing still remains the same. 99% of these scams are completely ineffective if you simply remember to never enter your password on a page that you clicked on a link in an email to get to. 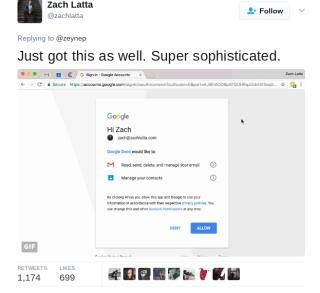 If it's a link to google docs, just open your browser yourself, type in www.google.com and go to google docs and log in that way. DON'T CLICK ON THE LINK IN THE EMAIL. ANY LINK. ANY EMAIL. EVER. I've been getting these I always forward them to Google's spoof dept. This isn't 'sophisticated' it just doesn't look like a crappy google clone. Keyword here is 'designer' - they hired a designer who knows how to mock up a google page. The 'sophistication' is the same as any other phishing scam.